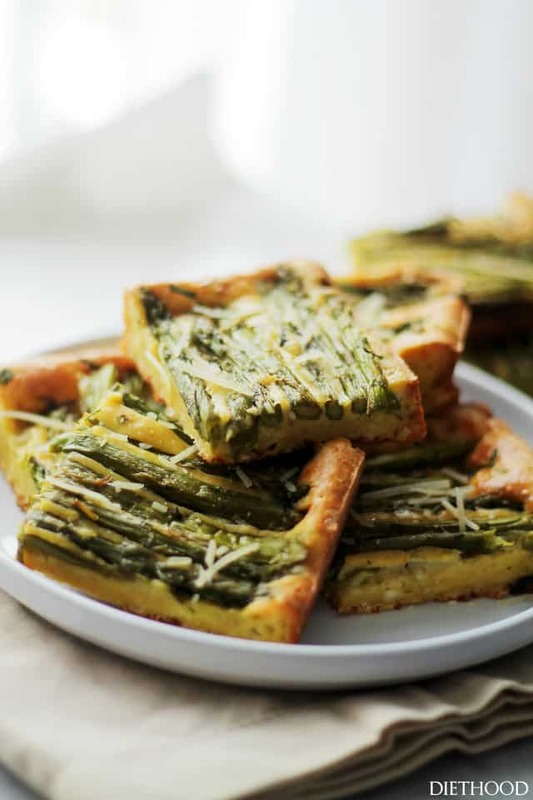 Cheesy Asparagus Frittata – Asparagus, parmesan and feta cheese incorporated into an egg batter to make this ridiculously easy, yet incredibly delicious and versatile dish! This photo says it all – it’s telling you to embrace your veggies! YUM! HI HI! What’s going on, friends! Feelin’ tired?? Welcome to Monday! I had two glasses of wine over the weekend and I still have a hangover. It’s like college all over again. Yet, I’d have a lot more than 2 glasses of wine in college (read: cheaaaap wine. read: 2$ bottles), and hangovers were cured with breakfast pizzas and pop. And NOT hot tea and biscotti… I’m not even kidding. I’m sippin’ on said tea as we speak. But, you’re here to talk about asparagus… it’s kewl. 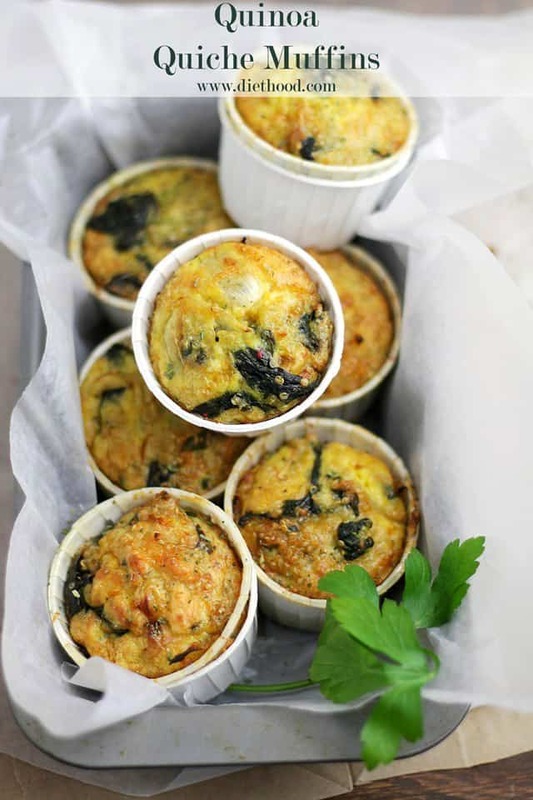 Let’s discuss long, green veggies swimming in eggs and cheeeeese! Before we move any further, and more importantly, before I forget, if you are into using the egg-substitute-liquid stuff, this is the recipe for you! I didn’t use it in this recipe, but I have made it with an egg substitute before and it works out perfectly. Just a suggestion. Okay, so, hey, this stuff is magical! Yes, it is, and I’ll tell you why. It’s magical because it makes a 5-year old veggie hater into a 5-year old veggie-loaded frittata lover! If that’s not magic, then I don’t know what is. Also. This? I normally just call this an egg casserole. Or an egg bake. BUT the internets tells me that it’s a quiche or it could also be a Strata, it says. Or a Frittata. In other words, I’m just trying to tell you that it took me 22 minutes to decide on a title. Also, again. This? This is like combining everything I’ve ever loved in a pan and baking it to a fluffy, cheesy, flavorful perfection. 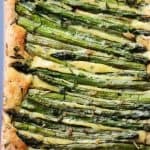 Here is the thing about this little brinner, breakfast, dinner meal: it has an identity crisis and the asparagus TOTALLY shine. Seared, seasoned and chopped, they are the prettiest addition to our casserole. Err. Frittata. Egg Bake? I get that many of us are quite different, but a casserole made with cheese and a vegetable is a legitimate dinner in my world. One more thing? You can add whatever veggies you like to this and it will turn out amazing. I promise. I’ve done it plenty of times. 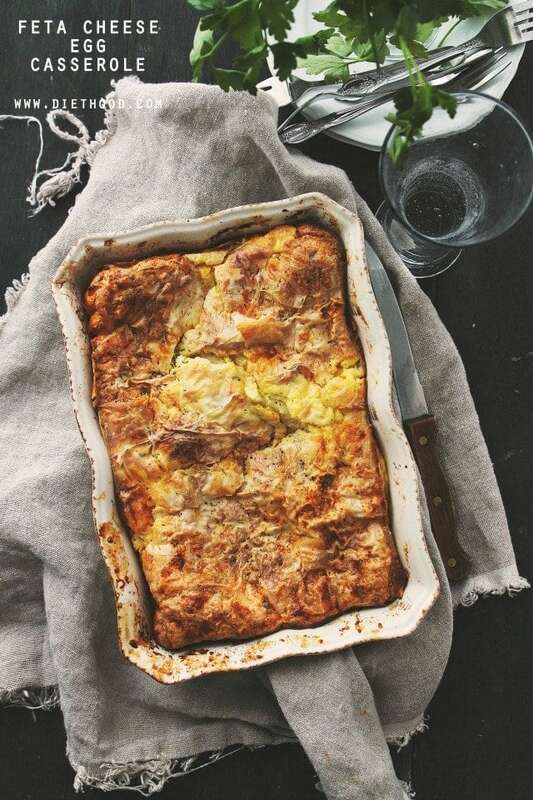 Turkey Frittata, anyone? Word. Asparagus, parmesan and feta cheese incorporated into an egg batter to make this ridiculously easy, yet incredibly delicious and versatile dish! Lightly grease a 11x7 baking pan with cooking spray and set aside. Heat the oil and butter in a large non-stick frying pan over medium-high heat. Add garlic and cook for 30 seconds, or until fragrant, but do not brown. 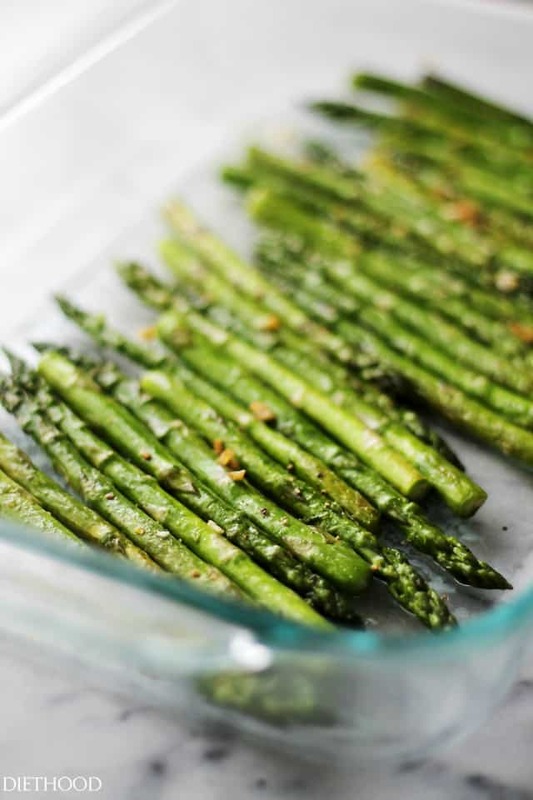 Add asparagus, season with salt and pepper and cook for 6 to 7 minutes, or until tender, turning asparagus to ensure even cooking. Set aside. Place the eggs, salt, pepper and flour in a bowl and mix well to combine. Add cheeses and thyme; continue to mix until thoroughly incorporated. Transfer egg mixture to previously prepared pan. Bake for 35 to 45 minutes, or until golden brown and cooked through. Cut and serve with a dollop of plain yogurt on top of each slice. Trim the ends of the asparagus by simply taking the end of the asparagus between your thumb and forefinger and bend until it breaks. I make fritatas all the time but never like this. 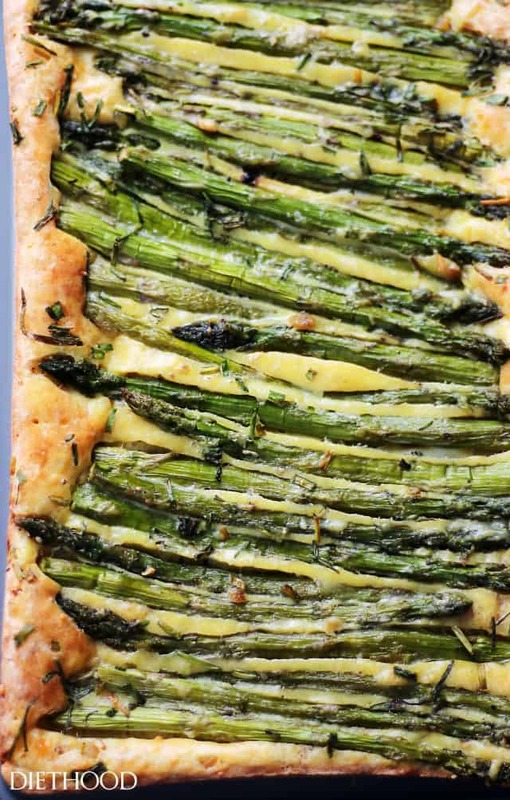 Love that you made it in a loaf type pan and arranged the asparagus on top so beautifully. I made this tonight. The flavor was very good, but the texture was cake like. I was expecting it to be more like a frittata. I wonder if you meant the amount of flour to be 1/2 cup instead of 1 cup. I’ll try this again but with less flour. No need to add salt since feta is already salty. 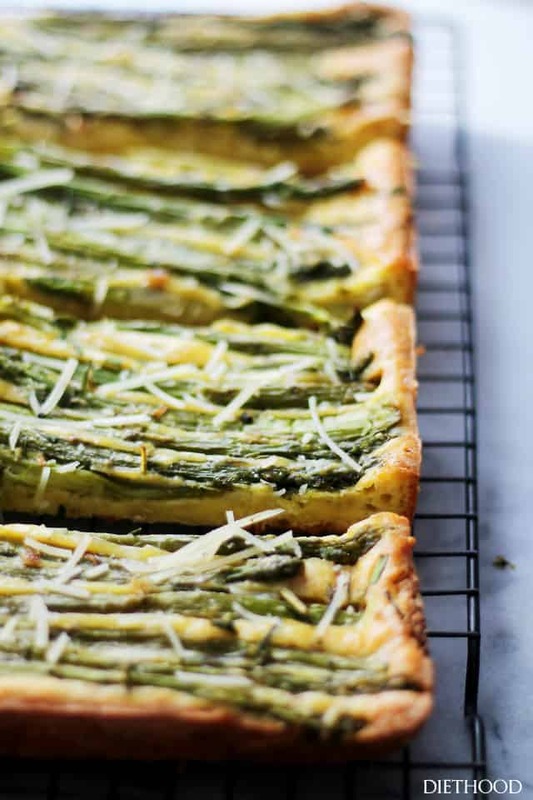 Asparagus has never looked better, I think I need to make this for brunch (or dinner) asap! I love asparagus! This such a unique way of incorporating it into a breakfast/dinner meal. Swoon! Egg, veggies and cheese is definitely a legit dinner. One of my favorites too!